This image will be the first in a new series featuring the oceanfront during winter – At Water’s Edge. This shot is fitting as the opener, as this blue gate is what greets beachgoers when they first arrive at Pirate’s Cove. I’d never really noticed this gate before, nevermind be compelled to take a photo of it – but when I got to the ocean just after the midweek storm (that promised to deliver up to two feet in two days), the blue stood in contrast against the white snow on the ground and the otherwise colorless sky. I hope you’ll enjoy the series, I’ve enjoyed venturing down to the water despite the weather. 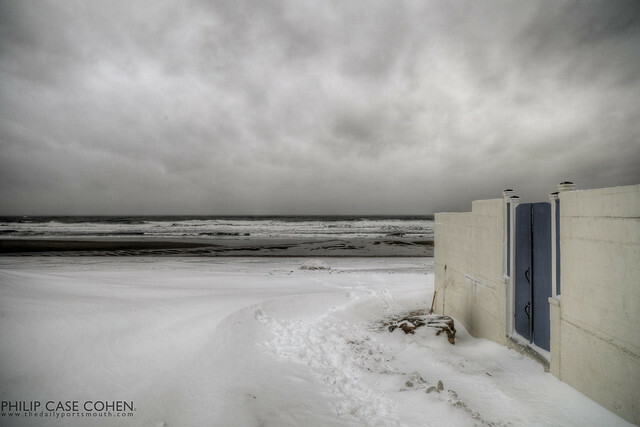 (I’ve also been inspired by friend and talented photographer, Bob Lussier, with his latest series “Off Season”). Meanwhile..check back later today for some exciting news about a show opening at 100 Market Street!